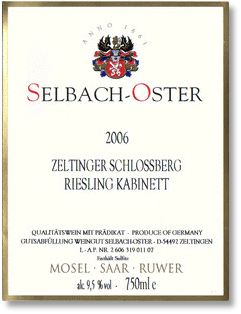 Name of producer or estate in this case is "Selbach-Oster". There are about 100,000 grape growers in Germany, yet only about one fourth as many wine producers. If the label indicates "Erzeugerabfüllung" (estate bottled), it assures you that the grapes were grown and the wine was produced by one and the same grower or cooperative of growers (Winzergenossenschaft). As an alternative to "Erzeugerabfüllung", estates and growers that grow, produce, and bottle their own wine can use the term "Gutsabfüllung" on the label. The grower or collective group of growers is responsible for and guarantees the quality of the wine. Sometimes the bottlers or shipper will assume responsibility and will be identified on the label as "Abfüller." The vintage is the year in which the grapes were harvested. Wine is an agricultural product and consequently very dependent on the weather, which in Germany, unlike in more southern climates, can be extremely variable. The often difficult to pronounce names on the label indicate the village where the vineyard is located (identified by the -er suffix) followed by another name (often ending in -berg [=mountain, slope] indicating the vineyard site. Therefore, the name of the vineyard on the label to the left is the "Zeltinger Schlossberg". This means that the wine comes from the Schlossberg vineyard located in the village of Zeltingen. Proprietary names like "Liebfraumilch" and "Bishop of Riesling" have no vineyard designation; they are a blend of wines from several vineyards. The grape variety used to make a wine is the single most influential factor determining its taste. Different grapes have different flavors, just like different fruits have different flavors. For example: Riesling is a very fruit-driven variety, while Gewürztraminer has very floral, perfumed flavors reminiscent of rose petals. In comparison, Chardonnay is a spicy grape with elements of ripe apple, tropical fruit and occasionally butter. German wine is classified into four quality categories: Deutscher Wein, Landwein, Qualitätswein (QbA) and Prädikatswein. The latter is further divided into levels of ripeness: Kabinett, Spätlese, Auslese, Beerenauslese, Eiswein and Trockenbeerenauslese. See below for more information. Each of the quality categories is determined by the level of ripeness that the grapes have achieved by the time they are harvested. Riper grapes provide more aroma and more flavor. The riper the grapes, the higher the position on the pyramid the wines made from those grapes will be. Made from normally ripe and slightly under ripe grapes. Primarily consumed in Germany; very little is exported to the US. These wines only have to comply with few restrictions and the wines are not officially tested. They do not have an AP-Number. A superior Deutscher Wein with a minimum of .5% more alcohol. The wine must come from one of 19 specified wine districts. A Landwein must not contain more than 18 grams of sugar per liter. These wines have to obey the regional appellation laws and are tested for compliance by an official committee just like quality wine with attribute and subsequently receive an AP-Number, which table wine does not need to be sold. These laws ensure that the wine is from one specific wine-growing region, is made of approved grape varieties and reached sufficient ripeness for a quality wine. Nevertheless, these wines are chaptalized (chaptalization: sugar is added to the juice before fermentation to increase the alcohol level after fermentation. Chaptalization is commonly used in all wine producing regions of the world). The chaptalization adds body to these otherwise lighter wines and makes them great simple food wines, enjoyable on a day-to-day basis also by themselves or as spritzers (mixed with Club Soda). The German wine law refers to the following category as Prädikatswein (previously referred to as Qualitätswein mit Prädikat); representing graduating ripeness levels, which are in ascending order: Kabinett, Spätlese, Auslese, BA, and TBA. These wines are all naturally produced, no chaptalization. Usually light wines made of fully ripe grapes. Intended to be a light quaffing wine or to go with light food. Generally light in alcohol and calories. Can be dry, medium-dry or sweet. These light wines have about 2 to 5% less alcohol than Californian wines but they are no less tasty. It literally means late harvest. Wines of superior quality made from grapes harvested after the normal harvest. These wines are more intense in flavor and concentration than quality wines and Kabinetts. Good with richer food or by themselves. The later harvest lets the grapes dry and ripen on sunny autumn days, which increases the intensity of the fruit and the flavors. Can be dry, medium-dry or sweeter style. Good values. Harvest of selected, very ripe bunches. Noble wines, intense in bouquet and taste. Often resembling dessert wines and sweet, but they can be dry, medium-dry or sweet. Dry Auslese wines are similar to Alsatian Grand Cru Rieslings. Harvest of individually selected, overripe berries. Remarkably rich, sweet dessert wines to be enjoyed by themselves or with dessert. Wines of at least BA intensity, made from grapes harvested and pressed while frozen. Truly unique wines with a remarkable concentration of fruity acidity and sweetness. Harvest of individually selected berries that are overripe and dried up on the vine almost to raisins. Rich, sweet, luscious, honey-like wines. NOTE: All wines up to and including Auslese (Deutscher Wein, Deutscher Landwein, Qualitätswein (QbA), Kabinett, Spätlese and Auslese) can be DRY, MEDIUM-DRY or SWEETER STYLE. The winemaker decides whether he or she wants these grapes to make a dry or a sweet wine. Riesling is the grape that CAN do both. The taste and style in terms of sweetness of a wine depend on the cellar master and are determined in the cellar; totally independent of the grape. This is not to be confused with quality category, or ripeness, which depends on the weather and is determined in the vineyard. Whether a wine is dry or sweet can be indicated on the label. Two new classifications of dry wines, Classic and Selection, were established in 2000, which simplify matters for the consumer. 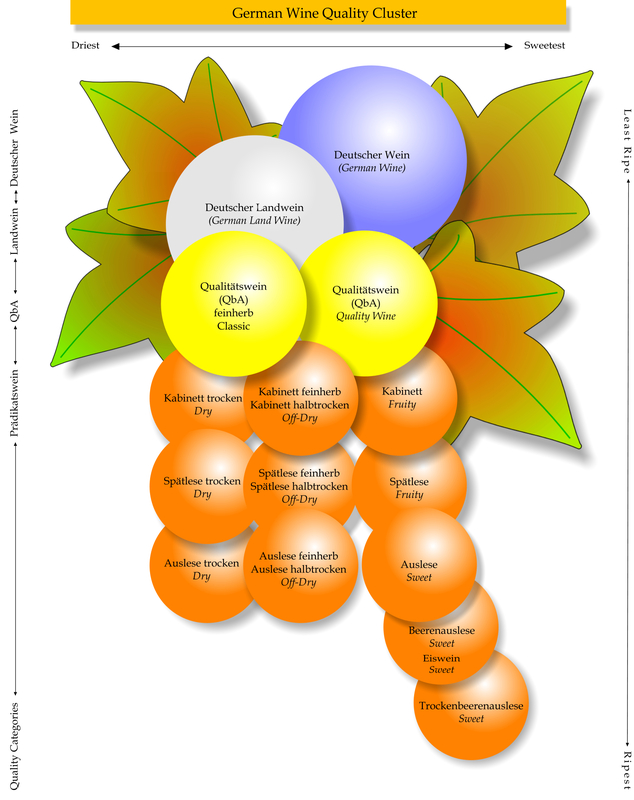 Winemakers in all 13 German wine-growing regions can produce these wines, provided they are above average in quality, harmoniously dry in taste, and made from a traditional grape variety, such as Riesling, Silvaner, Rivaner or a Burgunder (Pinot) variety. The concept is designed to impart a clear profile regarding a wine's quality and taste. This indicates a dry wine without perceptible residual sweetness. It never contains more than 9 grams of residual sugar per liter and often less. It is very dry. These wines are semi-dry and may have not more than 18 grams of residual sugar per liter. With this barely perceptible sweetness, halbtrocken wines are considered "dry" by most wine lovers. These wines are easy to recognize. The labels bear the Classic logo next to the name of a traditional grape variety. The name of the producer and wine-growing regions are also mentioned, but vineyard names have been deliberately omitted. Selection wines must meet additional quality criteria: grapes must originate from an individual vineyard site (it is named on the label) and be harvested by hand; yields are lower than prescribed by law; first release is September 1st of the year following the harvest. Because all Classic and Selection wines are harmoniously dry in style, the terms "trocken" (dry) and "halbtrocken" (off-dry) are superfluous. The VDP.CLASSIFICATION is based on an in-house statute of Germany’s Prädikat wine estates, in which the quality of a wine is defined according to “terroir,” i.e., origin and quality are inherently linked. For the Prädikat wine-growers, the vineyard site is the decisive mark of quality.The goal of the VDP.CLASSIFICATION is to assess the quality potential of Germany’s very best vineyard sites; secure the future of Germany’s unique viticultural landscape; restore esteem for Germany’s outstanding dry wines; and underscore the traditional connotation of the Prädikats as attributes reserved for wines with natural, ripe sweetness. The new VDP.CLASSIFICATION is valid as of vintage 2012. GUTSWEINE are good, entry-level wines in the VDP's hierarchy that inherently links wine quality with origin. The wines originate from an estate's holdings within a region, and they meet the stringent standards prescribed by the VDP. ORTSWEINE originate from a village's best vineyards that are planted with grape varieties typical of their region. A dry VDP.ORTSWEIN is labeled "Qualitätswein trocken". A VDP.ORTSWEIN with natural ripe sweetness is labeled with one of the traditional Prädikats. Maximum yield is at 75hl/ha. VDP.ERSTE LAGE designates first-class vineyards with distinctive characteristics. They provide optimal growing conditions, as evidenced over a long period of time. They are planted with traditional varieties, as determined by each region. A dry wine from a VDP.ERSTE LAGE is labeled "Qualitätswein trocken". A wine with natural, ripe sweetness from a VDP.ERSTE LAGE is labeled with one of the traditional Prädikats: Kabinett, Spätlese, Auslese, Beerenauslese, Eiswein or Trockenbeerenauslese. Maximum yield is at 60hl/ha. The grapes have to be harvested by hand while the sugar content has to be at least at Spätlese level. The VDP.ERSTE LAGE wines are presented on the 1st May. VDP.GROSSE LAGE designates the very best vineyards of Germany, within which the finest parcels have been narrowly demarcated. With their site-specific characteristics, these wines are particularly expressive and have exceptional aging potential. They are planted with traditional varieties best suited to a particular site, as determined by each region. A dry wine from a VDP.GROSSE LAGE is designated VDP.GROSSES GEWÄCHS and labeled "Qualitätswein trocken". A wine with natural, ripe sweetness from a VDP.GROSSE LAGE is labeled with one of the traditional Prädikats: Kabinett, Spätlese, Auslese, Beerenauslese, Eiswein or Trockenbeerenauslese. Maximum yield is at 50hl/ha. The grapes have to be harvested by hand while the sugar content has to be at least at Spätlese level. The sweet VDP.GROSSE LAGE wines are presented on the 1st may. The white VDP.GROSSE GEWÄCHSE are presented on the 1st September, the red VDP.GROSSE GEWÄCHSE one year later. If none of the above dryness levels can be found on the label the wine is most likely a sweeter style wine, but it can range from off-dry to fully sweet. Generally, the sweetness in the wine does correlate with the ripeness levels. This coding enables the official testing centers to identify a wine. If there is any complaint or doubt of authenticity of the wine, sealed bottles which the winery has to keep for a number of years can be cross checked and tasted to investigate. German wine labels are very informative once all the information given can be identified and interpreted. While many other wines will list only the producer, vintage, region, and country; German labels will state the quality level of the wine, the grape, the vineyard, and a style or taste indication.